In response to the October & November sexual assault allegations arising across industries from Tech to VC to Entertainment to Advertising, our team at Mogul was flooded with requests for help and support. We realized we were in a unique position to address this issue. 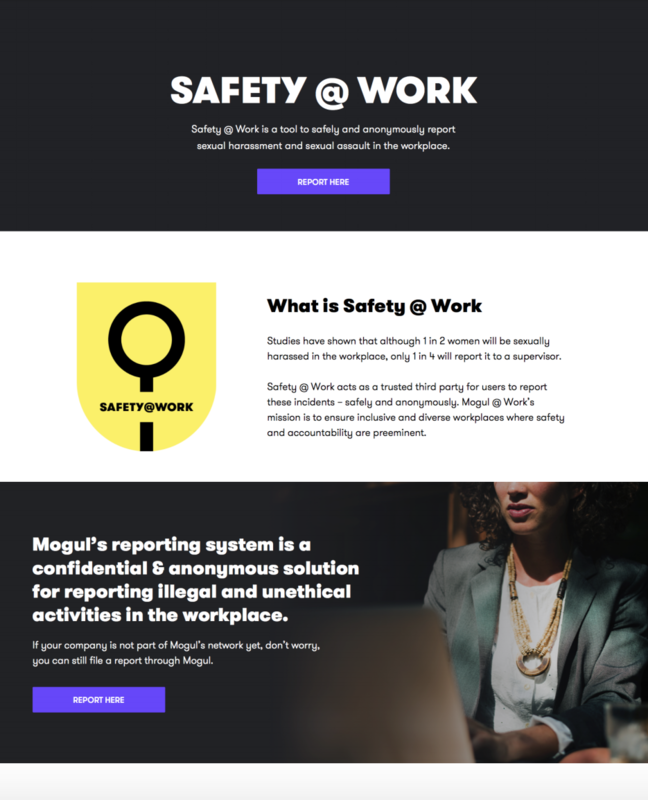 As a trusted platform for millions of women worldwide, with global scale and reach, as well as historic partnerships with thousands of HR Leaders across the Fortune 1000 and top organizations worldwide, we have launched a new transformational tool called: Safety @ Work. Developed by our Mogul @ Work division in collaboration with top VC funds, Safety @ Work enables employees of participating companies to log in and anonymously report incidents of sexual harassment and sexual assault to multiple HR leaders and stakeholders at one time. 1 in 2 women will be sexually harassed in the workplace; yet only 1 in 4 will report it. Safety @ Work's anonymity functionality largely addresses the issues that lead to under-reporting, including fear of retaliation (which are not unfounded according to research studies), reports going unaddressed, lack of awareness of where and how to report it, as well as allowing bystanders to report what they witness. We hope that, with this global start, the number of incidents that go unreported will dwindle, and women and men both will begin to feel safe at work again. Thank you for the work you all do @Tiffany Pham! elena and 32 others upvoted this.